The seigneurial system is method of land distribution which existed in France which and was put in place in New France by the French regime. In this system, large plots of land (seigneuries) were granted to a person of rank (the Seigneure) in return for homage to the king, payment of a fee, an obligation to military service as well as a promise to carry out specific obligations. The land was parceled out and leased to tenants (censitaires) in return for paying certain dues. There were few roads in those times and river travel was the main means of movement. As a result, plots of land were usually long and narrow to ensure that censitaires had access to an adjacent river. Foucault and Noyan were two seigneuries north of Lake Champlain. Foucault was on the border with the United States and Noyan was adjacent to Foucault. With the downfall of New France in 1763, some of the seigneures sold their land to British nobility. Sieur Foucault, owner of the Foucault seigneury sold it to General James Murray and it was subsequently leased by Colonel Henry Caldwell for 99 years. The descendants of Sieur Noyan sold the Seigneury of Noyan to Major General Gabriel Christie. The two seigneuries became known as Caldwell and Christie Manors. After the start of the American Revolution, loyalists from the thirteen colonies, primarily New York state, began moving north along Lake Champlain and the down the Richelieu River and settled in Christie Manor. 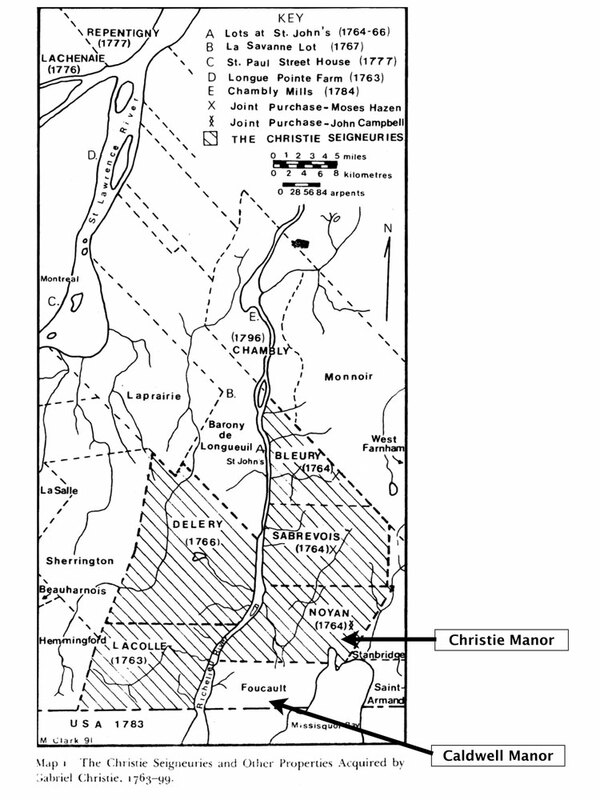 The seigneurial system of land tenure in Christie Manor was carried over from the French regime. Loyalists who settled in this area became tenants i,e, censitaires and paid fees to the seigneure, Colonel Gabriel Christie and subsequently his heirs. The first record of our ancestor, Benjamin Bullock, shows up on a lease agreement between Benjamin and Napier Christie Burton, the seigneur at that time. Loyalist were those leaving the American colonies following the American revolution sometime in the 1780's and 90's. Benjamin's arrival in Noyan sometime in 1819 or following is too late for him to be considered a loyalist. However, it is possible that he was following either a family member of family friend who had migrated here as a loyalist. It appears that strained patriotic relations between relatives and former friends did not last for many years, as within a very short time, non-loyalists were coming forward to take up crown lands east of the seigniories and also to purchase titles on conceded lands in the seigniories. Many references may be found to this effect, in particular, the list of persons who took the oath of allegiance at "Missiskoui Bay" in 1795. Also, agents travelled to the colonies to encourage people to come northward. Nevertheless, perhaps the settled loyalists themselves were the greatest propagandists for the development of the new country. Relatives of various degrees came to the manor and settled likely due to the good reports from the loyalists. The settlers of British origin were dissatisfied with the seigneurial system of land tenure. Petitions were made over the years to have it changed. After many attempts to modify it, the seigneurial system was abolished in 1854. Seigneurs were compensated. Censitaires were given free and clear ownership of the land they were leasing. 1. "The Seigniories of Missisquoi." Fifth Report of the Transactions of the Missisquoi County Historical Society: Consisting of Papers, Sketches, Items and Portraits of Local and National Interest. Missisquoi County Historical Society, 1913; pp. 29 to 60. 2. Derick, Herbert. "The Two Manors." The Loyalists of the Eastern Townships of Quebec: 1783-84 to 1983-84 Bi-centennial. Stanbridge East, QC: Sir John Johnson Centennial Branch, The United Empire Loyalists' Association of Canada; pp. 63 to 80.